ISC West 2018: SnapAV pitches OvrC to alarm dealers, a smart lock for newlyweds, neat fire-protection system that could spawn a category ... and more security and home automation from Vegas. Some fresh opportunities in video verification, one really interesting IoT device for fire protection, a jewel-encrusted smart luck and some other new security and smart-home finds at ISC West 2018. 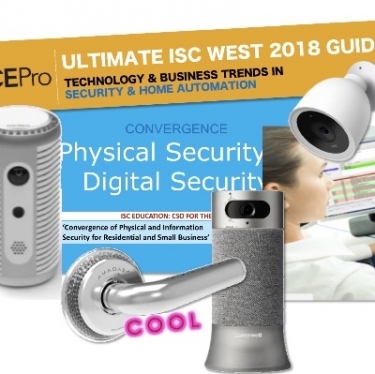 This week, the place to be for security and home automation is Las Vegas at ISC West 2018, the big trade show for the alarm industry. Even before the show opened this week, we discovered several interesting exhibitors, products and trends that we highlighted in our Ultimate Guide to ISC - both the pre-show Webinar and the extended 50-page Slideshare presentation (embedded below). Some of the finds are "interesting" in quotes, as in, "Uh, yeah, that's um interesting," while others are seriously, "Well THAT's super-interesting!" We don't go into too much detail below, for a couple of reasons: 1) We don't yet have much detail, and 2) We hope to entice you to crack open the ISC Slideshare. You can do a quick click-through in less than 21 seconds, or you can stay a while, and linger on a few interesting pages. Some of the finds are "interesting" in quotes, as in, "Uh, yeah, that's um interesting." You'll definitely want a good long look at page 34. This company is setting up a national network of eye witnesses to share their accounts with other concerned citizens. As if you wouldn't do that already for free, soon you'll be able to "Make money with your SURVEILLANCE DATA!" 1. SnapAV makes its first appearance at ISC ... not to push its Visualint and Luma surveillance systems but to spread the word about OvrC, the company's managed-services platform. Can security dealers milk this remote-managed system for recurring revenue? If anyone can, they can. We'll see. 2. There's a new smart lock in town and its, um, interesting, especially if you're looking for his-and-her smart rings to unlock this bejeweled hunk of hardware. Yes, the jewels are optional, but the company does offer the aforementioned wedding package. By the way, the products completely reimagine traditional smart locks, and I mean that in a good way. Definitely worth a look, even for highly practical people. 3. We've seen a few nice developments in fire protection over the past couple of years, especially as insurance companies get more involved with the smart-home industry. There are several solutions that have yet to make it to the mass market, but the innovations are there: an AI-driven multisensor that warns if conditions are conducive to a fire; a clever device (Life Door) that closes the door when the fire alarm sounds, and several products that can turn off a stove when it shouldn't be on (Nortek's 2Gig is showing such a product, Grill Guard, at ISC). At this particular show, however, I'm most interested in this feature-packed device that looks something like a bloated Amazon Echo. When smoke, fire, or related hazard is detected or predicted, this thing from OnTech sounds an alarm, shines a laser toward the exit, and captures thermal images to detect people and pets even through a haze. 4. Over the past decade or so, we've seen self-contained security systems that come out of the closet and into the living area, with every alarm and home-automation feature packed behind a giant touchscreen. These days, we're seeing a move back to the closet, or to a bookshelf at least. Manufacturers are decoupling their bulky all-in-ones, producing headless hubs that sit in a closet, along with UIs and peripherals that grace windows, doors and walls. Like the olden days. 5. There's lots of big stuff happening in the industry around neighborhoods and communities these days. Both Ring and Vivint provide crowd-sourcing platforms for sharing images and information about area shenanigans. In the category of "interesting with quotes" is a newcomer at ISC promising to present the "only, fully anonymous, network of concerned citizens in the nation. We all benefit from having access to the maximum amount of footage and eyewitnesses possible." As the owner of the start-up says, "Freedom is not free, our soldiers pay for our Freedom abroad ...."
The implications for radar and laser sensors in the home are ... interesting. Really, genuinely interesting. 6. The security industry already has a good handle on the DIY-assist market, melding self-installed products with recurring revenue. Here's one opportunity I didn't know much about until the ISC research: I-View Now provides camera and NVR manufacturers with a video verification platform so their customers can have cameras monitored by a central station. Most established suppliers in the security channel already have their go-to video-verification providers. On the other hand, manufacturers of consumer cameras don't have the same resources to patch into central monitoring stations. I-View Now provides that service for products such as Nest cameras and Honeywell's new crowd-funded security system. 7. The implications for radar and laser sensors in the home are ... interesting. Really, genuinely interesting. Users can map out protection zones down to the centimeter to create a "curtain" around a work of art or other protected object. Plenty of options this year at ISC, many looking pretty attractive for the residential market. 8. Sometimes it's what you don't see that can surprise you at ISC. This year, I was hoping to find a bunch of compelling solutions for the convergence of physical and digital security -- protecting things and data all at once. In our CE Pro Top 5 Home Tech Trends for 2018, we said this would be the year for the chief security officer (CSO) to emerge in the home market as it has already taken hold in commercial. You wouldn't think so, judging by a paucity of activity in Vegas. 9. There must be something in the water at all those video doorbell factories. Several of the start-ups are feeling pretty confident about their product launches. One newbie, that isn't Nest or any of the other established providers, claims to have the “World’s first AI doorbell.” Another start-up believes the “world’s most advanced video doorbell is also the world’s simplest." 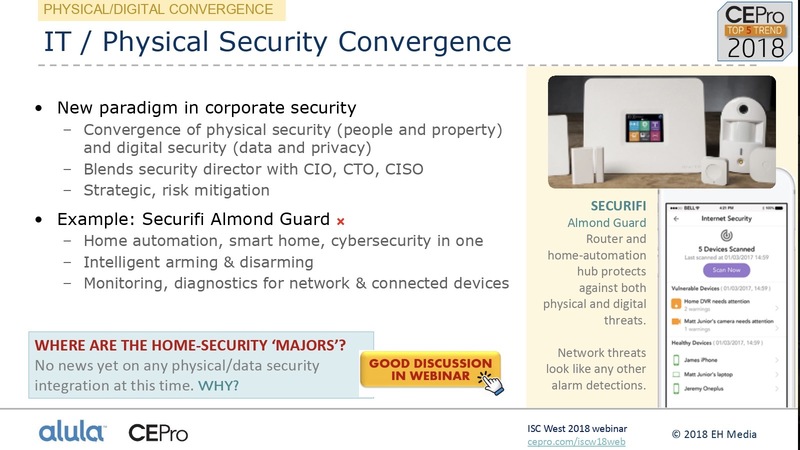 The next big thing for the Home CSO probably won't be found at ISC West 2018.